Home maintenance is an important part of homeownership, and homes require frequent care and attention throughout the year. For certain tasks, sometimes need professional help with home maintenance. When you have difficult or time-consuming home improvement, renovation, or repair needs, you can call on a Sears Handyman. Our handyman technicians have in a variety of home improvement tasks. 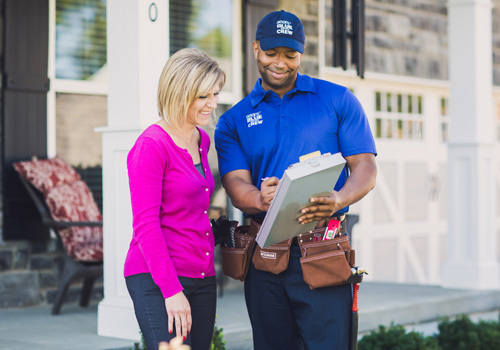 From plumbing issues to deck building, Sears Handyman technicians can assist with most minor to intermediate repair needs. Give us a call at (216) 539-2444. For minor electrical repairs that don't require a professional electrician but are a little too difficult for some homeowners to perform, Sears Handyman Services offers electrical repair servicing. Our handyman professionals can repair and replace ceiling fans, repair lighting fixtures, and install recessed lighting and LED lighting. Call today for these and other electrical needs. Most modern homes contain drywall, a common material used in home construction. Sturdy, and portable, drywall makes for great construction material, but drywall can break if struck by a door knob or other solid object, and sometimes holes from nails can make the drywall look unsightly. If you need minor or major drywall repair, contact the professional handymen at Sears Handyman Services. Our professionals know how to patch, tape, repair, and hang drywall - whether that means repairing existing drywall or hanging new wall from scratch. Often the site of barbeques and family gatherings, a deck provides a setting for outdoor relaxation. Taking care of a deck, however, requires much attention and responsibility. If you need deck maintenance or repair, our handyman technicians can help. We can both repair existing decks that suffer from problems like wood rot and we can build new decks from scratch. Finally, if you need your deck stained and treated to prevent water damage, our technicians can help with that as well. Fencing acts as a great way to enclose your yard, mark your property boundary, and create privacy while you're in your yard. If you'd like to improve your home by adding a privacy fence or picket fence, Sears Handyman technicians know how to install new home fencing. If you'd prefer the economic value of a chain link fence, our technicians can install those as well. Home painting can revitalize any home by giving walls and exteriors new life. Painting, though, can be a time-consuming chore, and some homeowners may have difficulty mounting ladders and using rollers to get to hard-to-reach places like ceilings or high walls. Likewise, you may have difficulty removing existing wallpaper so the underlying wall can be painted. For these painting tasks and others, you can contact a Sears Handyman professional. Our service staff will have your home's interior or exterior painted to your liking so your home can be revitalized.